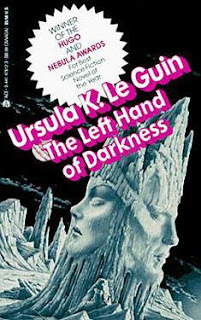 The Left Hand of Darkness is a science fiction novel by Ursula K. LeGuin. Like many good fictional stories from any genre, The Left Hand of Darkness is comprised of fully formed character development and the story is rife with mystery, suspense and deep human emotion. Even if said human emotions stem from androgynous figures known as Gethenians. On a mission to enlist the Gethen, also referred to as planet Winter, into the federation of 83 planets, alien Genly Ai recounts his time on Gethen as an Envoy for the Ekumen. Mixed with legends of Gethen and also seen through the eyes of Estraven, an exiled politician of Karhide, one of the countries of Gethen, you get a well rounded history of Gethen while following the trials and tribulations of Genly Ai. Now that last paragraph may just sound like nonsense, but once you get past the science fiction of the novel - after all sci-fi is just the vehicle to tell the story, and it is never what you are riding along in that is the forefront of your memory, but rather it is the journey that is most memorable – it is easy to enjoy the story and feel a connection with the characters, no matter how different they may appear physically. I was recommended Ursula K. LeGuin one evening after explaining my dream Timequake, and the story I want to write based on it. I enjoyed this book and the writing reminded me of other science fiction works I have read by Iain M. Banks.